Ba é Geingeas Cán, nó Temüjin, mar ab ainm dó ó thús a shaoil (1162? - 18 Lúnasa 1227), a d'aontaigh na Mongólaigh agus a bhunaigh Impireacht na Mongólach, an impireacht ab fhorleithne dá raibh riamh ann. Áiríodh mar uasal é toisc gur de shliocht na dtaoiseach é, rud a rachadh chun sochair dó agus é ag iarraidh cabhrach ar threibheanna eile. Rinneadh cleamhnas idir é agus cailín darbh ainm Börte nuair a bhí sé naoi mbliana d'aois. Ansin cailleadh a athair agus tháinig treabhchas eile i réim; ruaigeadh Temüjin, rud a d'fhág ag maireachtáil ón lámh go dtí an béal é le fada an lá, agus a rinne fear crua glic de. Ach bhí cairde aige, leithéid Bo'ortchu agus Djamuqa (cé gur fheall sé siúd air faoi dheireadh). I ndiaidh a chéile tháinig Temüjin chun cinn sa saol. Timpeall na bliana 1181 phós sé Börte, agus bhí ceathrar mac acu. Thosaigh sé ag déanamh comhcheangail idir na dtreibheanna, agus tar éis roinnt cogaí agus caibidlí gairmeadh Cán de (cé gur thit sé amach le Djamuqa dá bharr). Chum sé dlíthe a raibh rian na seantraidisiún orthu agus a rachadh i bhfeidhm ar ar lean é. Bhuaigh sé ar a shean-naimhde na Tartaraigh sa bhliain 1202, agus sa bhliain 1206 gairmeadh Geingeas Cán (Ĉingis Xaan nó Tiarna Aigéanach) de. Chruinnigh treibheanna uile na Mongóile thart air agus bheartaigh sé ar thuaisceart na Síne a ghabháil. Chuir an Balla Mór moill dhá bhliain air, ach chreach sé an tuaisceart faoi dheireadh agus ghabh Beijing féin sa bhliain 1215, cé gur dhiúltaigh sé dul isteach ann. Ina dhiaidh sin rinne sé ionradh ar an gcuid eile den Áise Lárnach, ag dul chomh fada le habhainn na hIndia agus leis an bPeirs. Lean sé air ag ionsaí na Síneach: ghabh sé stát na Siach (Xia) Thiar, agus bhí rún aige impireacht na Jin a scrios. Fuair Geingeas Cán bás de bharr titim de chapall agus é i mbun seilge. Tugadh a chorp ar ais chun na Mongóile, agus deirtear gur maraíodh gach duine a chonaic an tsochraid ar eagla go bhfeicfí cár cuireadh an Cán. Juvaynī, Alā al-Dīn Atā Malik, 1226–1283 (1997). "Genghis Khan: The History of the World-Conqueror [Tarīkh-i jahāngushā]". Seattle: University of Washington Press. Rashid al-Din Tabib (1995). "A Compendium of Chronicles: Rashid al-Din's Illustrated History of the World Jami' al-Tawarikh". Oxford: Oxford University Press. Rashid al-Din Tabib (1971). 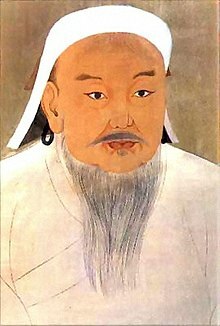 "The Successors of Genghis Khan (extracts from Jami’ Al-Tawarikh)". New York: Columbia University Press. "The Secret History of the Mongols: A Mongolian Epic Chronicle of the Thirteenth Century [Yuan chao bi shi]" (2004). Leiden; Boston: Brill. Tugadh an leathanach seo cothrom le dáta an 15 Feabhra 2018 ag 23:24.